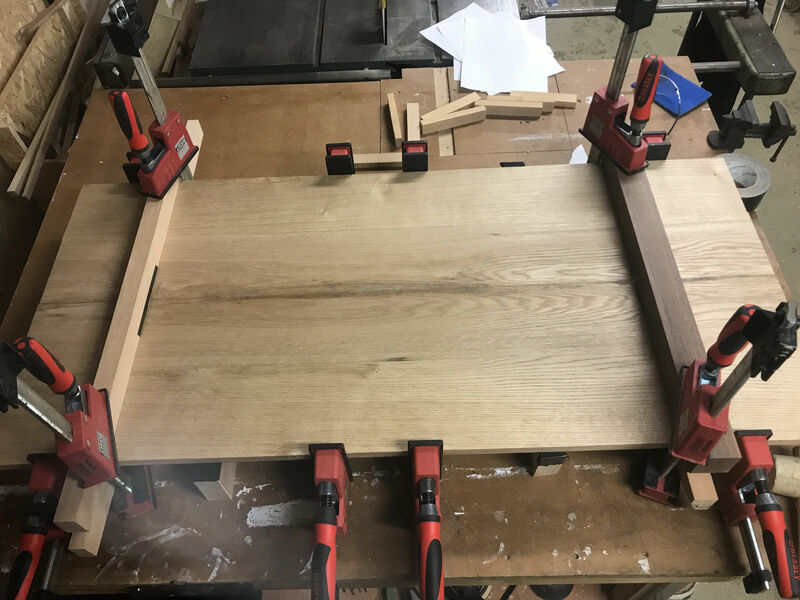 so i am building an oak table top at the moment and would like some advice on the glue up itself. i bought all the oak and had it planed on one face and jointed on one side and then ran it through my electra beckum planer to square up the adjacent faces. I then used a biscuit joiner to get everything nicely aligned for the glue up. Unfortunatly due to the capacity of my planer i had to cut down the original width to be able to pass the edges through on the planer. so i had 6 panels to glue up. i dont have any sash clamps or anything in my shared workshop so i set the panels on some 2x4s and glued up the panels with regular wide clamps. everything is pretty dead flat needing only some minor leveling treatment with a belt sander before orbital sanding. The only minor problem is the last panel isnt so well aligned with the others and sort of angles up slightly. As a fairly novice woodworker i feel i have two choices at this stage belt sanding the last 3-4 inches on this section as this is the only really noticible part where its starts to angle up. or running a track saw through the glue line and biscuit joints and trying to glue it up to the rest of the panel flat again. its not a major slant but enough for me to notice when looking at the joined endgrain. what do you think would be the best route to go? Nick, beg borrow or steal some sash clamps. This job isn't really possible without. What about making sash cramps using timber lengths and wedges - is that a realistic option? thanks for the reply guys. I think i'm gonna go ahead tomorrow and cut down the joint and try and rectify it as much as possible. unfortunatly im too broke at the moment to afford a set of sash clamps nor know anyone to loan me some. i dont have a jointer to plane the edges again but a new blade on the table saw. so will try and get the edges sitting flush and do some dry fits to see if i can atleast improve it a little bit before glueing it up. here is a photo of it in the clamps. the last panel on the right angles slightly down but not very easy to notice in the photo. You mentioned a track saw which would probably be easier than humffing that over a table saw. Cut once to separate the offending piece then secure both pieces (screws in the ends or hot glue and ensuring the pieces are level) and cut again down the gap ensuring the blade takes a bit off each. The resulting kerf should give you two pieces that will mate together. Depending on the blade you have you may want to do some tidying up with a pane. Table or track saw you're going to end up with a narrower piece on the end but hopefully not too much. Nelsun wrote: You mentioned a track saw which would probably be easier than humffing that over a table saw. Cut once to separate the offending piece then secure both pieces (screws in the ends or hot glue and ensuring the pieces are level) and cut again down the gap ensuring the blade takes a bit off each. The resulting kerf should give you two pieces that will mate together. Depending on the blade you have you may want to do some tidying up with a pane. Thanks Nelson! that seems like a solid idea! think i saw someone doing the same on a youtube video. assuming i would need to foam underneath the panels for that. Think i will give that one a go tomorrow! Hi Nick. Where abouts are you. Hornbeam wrote: Nick, beg borrow or steal some sash clamps. This job isn't really possible without. yup out In berlin at the moment although from the uk. Thanks for your input everybody will keep you updated on how this turns out. got my eye on some sash clamps for future panel glue ups. If you don't have cash for proper sash cramps, in my experience alternatives do work. I've used scrap wood with screwed-on stops + folding wedges to edge join 8" x 1" softwood. Well worth trying. Remember to put some above and some below the job. I've also used threaded rod / studding to pull up suitable cauls. You can get 8mm or 12mm quite easily from electrical wholesalers. Cauls can ve offcuts from building work. Obviously it's not as quick as cramps but as so often there's a trade off between cost and convenience/time. Doing them all together in one bash can be difficult especially if you don't have skills, good clamps, workspace etc. Sounds tedious but it's a lot easier of you just do one joint at a time: glue two pieces together, next day add another. Just have to fill in the time between with something useful, such as making the undercarriage etc. Wanted to ask you guys what would be the best route for a novice to go on doing mortise and tennon joinery for the aprons and legs. I thought either using a spiral bit for the mortise on the router table using some marked masking tape on the table as a indicator for the start and stop point. Or cutting out the waste with a spade bit on the drill press and using a chilsel to clean the rest up. I'm more hesitant with the router table method. I've been using it for basic profiling and template cutting but this cut feels a bit more advanced but could achieve smoother results. On the other hand I'm not amazing with a chilsel either but feel this could be quite easy and the mortise would be hidden anyway. The tenons I would cut on the table saw. Last edited by Nick b on 24 Feb 2019, 18:31, edited 1 time in total.